View From The Hotel Room Balcony - Nice! 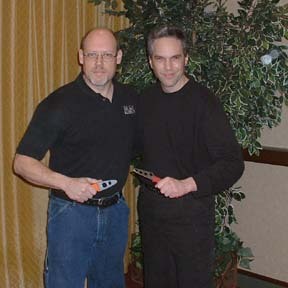 On January 27-28 Mike Janich presented a seminar on his Martial Blade Craft (MBC) system at Dwight McLemore and Gary Mah's 3rd annual "Bowies on the Beach" training camp held at the Sheraton Hotel in Virginia Beach, VA.
My long time friend and training partner Kurt Piller agreed to make the long trek to VA with me, and he was a stalwart force at the wheel, getting us "there and back again" through the many miles of the "Mordor of the North East" (known by some as Pennsylvania) and beyond! 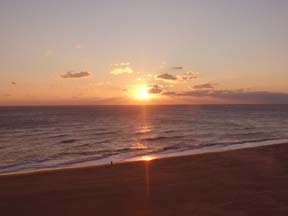 The hotel was a magnificent place with rooms overlooking the beach and a friendly staff. Though the weather was quite cold, the views from the balcony in the morning were certainly inspirational as we sipped our coffee. The beach at this time of year is mostly deserted, and that was a plus in my book. I could not even imagine being there when it was the height of tourist season. On Friday night we got to meet up with a lot of the other seminar participants at dinner. Some had driven from as far as Ottawa, Canada (about 15 hours) to attend the event! The group was a nice mix of folks with a diverse group of skills and backgrounds. 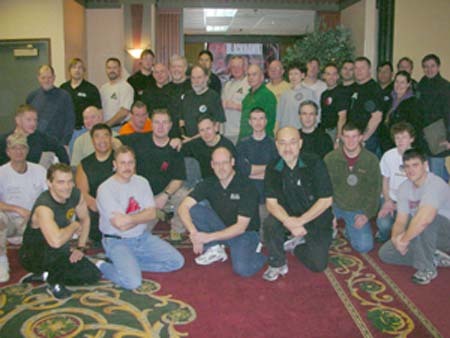 Some were law enforcement, others longtime martial artists, some were mainly shooters and a few had absolutely no previous knife training at all and were here to learn for the first time! Group Picture From Bowies On The Beach 2007 It was nice to get to catch up with some of the folks I knew like Mike Sastre of River City Sheaths and to make some new friends, as well as to finally get a chance to put faces to so many folks who I had only known as a name on an internet forum or through e-mail. With such a variety of skill levels and a such large group (just over 40 people) I was interested as an educator to see how Mike would handle teaching things over the weekend, and was ready to get to training the next morning! Mike started the seminar off with a power point presentation about what we would be doing in the course, and this helped everyone to get in the right tactical mindset for the weekend. 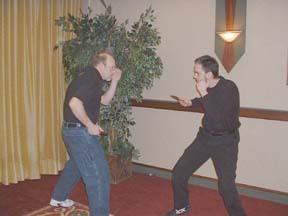 From there, we quickly got to work on delivering basic attacks and then learning a simple sequence to deal with each one. 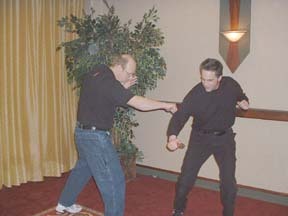 The responses were all similar in nature and stressed cutting several specific muscle groups to stop an opponent from being able to attack you. The reasoning and logic here is sound and presents very specific advantages. 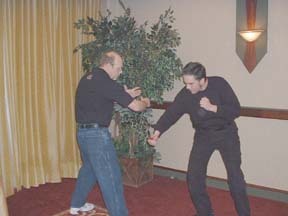 Because all the basic defense sets were similar, they were very quick to learn and then build upon with base disruptions, foot traps, sweeps, and all manner of other lower body work. 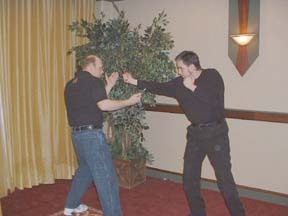 The second day of training continued on with the material from the first day, expanding on it and introducing new drills and combinations as well as introducing knife opening techniques and options for when you must face the blade when unarmed. 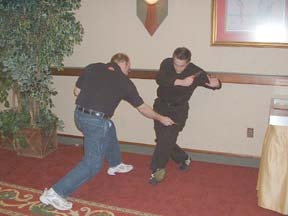 We also covered some variations on the famous "hubud" energy drill and worked on passing the force (palis palis) with reverse grip and empty hands. At the end there was time for some brief questions and the group was presented with certificates for completing the training. Overall the seminar was a lot of fun and I think Mike Janich presented a solid introduction to his MBC system. 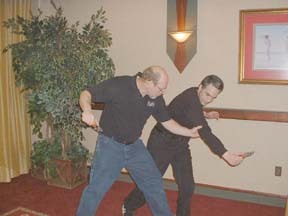 For the folks who were there who had never trained in the knife before, I think they got a lot of good basics that they can rely on for now and build upon later if they choose. Mike's presentation is very relaxed and good natured while remaining focused on the task at hand and the realities of the blade and this helps in achieving results for the students by inspiring their confidence that they too can do it! 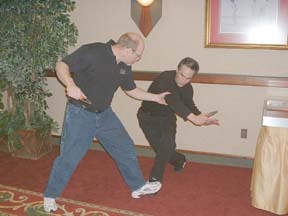 During all the training, Mike Janich and his training partner Mike Rigg of Paladin Press moved throughout the room to help each participant learn the techniques presented, and from what I saw it looked like everyone was moving right along with the material.